Last month I set a new goal for myself and decided to focus on creating some new designs that don’t rely so heavily on steel cables. Up to this point, the use of steel cables has been the signature of just about all of my designs, but it has also created a bit of a bottleneck in my production. The process of stringing and tightening steel cables one by one for every piece I manufacture is a time consuming one and, frankly, can get pretty boring. I have spent thousands of hours wiring up the same designs over and over and, while I enjoy creating tension-based designs, I wouldn’t mind branching out. In addition to being time consuming, the process of tensioning steel cables took me several years to perfect and it cannot be instantly taught to another person. I have occasionally considered the possibility of hiring someone to help me with manufacturing my products, but the idea is always squashed when I consider the complexity involved in making my designs. By developing designs that have fewer or no steel cables, I’m hoping to have a line of products that is easier to make and that can be manufactured, at least in part, by people other than myself. At the same time, I want to maintain a unique aesthetic that will set my work apart. It’s a bit of a tricky balance to find, but I took my first crack at it with a new lamp design. With this new lamp I was, unfortunately, not very successful at developing a product that would be easier to produce. Although I came up with a design that required only two cables and was relatively easy to wire up, I got carried away with creating a shade that incorporated an almost unmanageable number of walnut slats and thus effectively substituted one time drain for another. 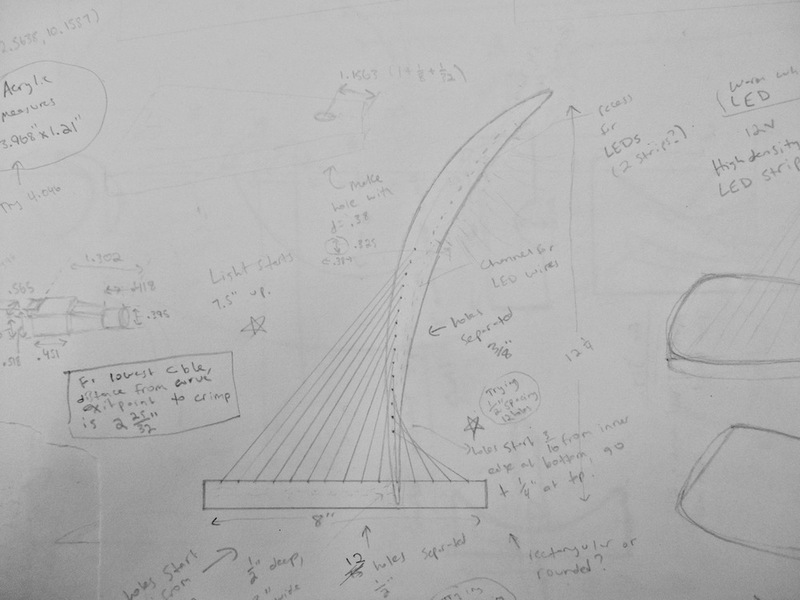 As always, the design process for the lamp began with some brainstorm sketches. This was as far as I got with my sketching before turning to Autodesk Inventor. Though it’s unlikely that this lamp will become one of my products, its creation was by no means a waste of time. There’s always a period of experimentation (and often failure) when I’m working on a new idea and it’s through this experimentation that I learn new skills and generate new ideas that, if not immediately applicable, may come in handy down the road. In this instance, when coming up with ideas for the lamp, I decided to experiment with using the CAD program Autodesk Inventor as a key element in my design process (I’m a little late to the party, I know). 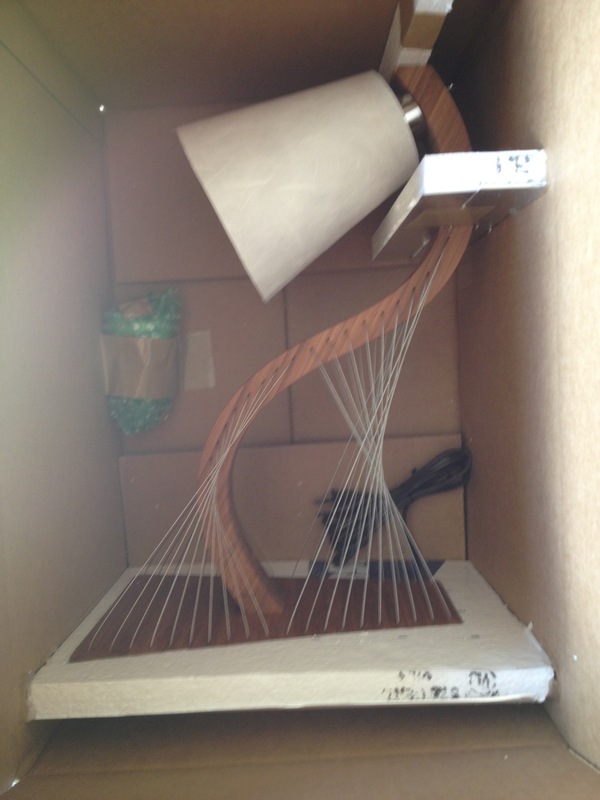 An early version of the lamp featured only one support and cables connecting directly downward. Another iteration explored a close-topped shade with crossing cables. This rendering is close to the final design, but with a simpler cable orientation. The final design I settled on incorporated two supports and a crossing cable pattern. In the past, I have relied mostly on my sketchbook for brainstorming and visualizing a final product before beginning to prototype it in three dimensions. In this case, I did some very early brainstorming in my sketchbook, but then turned to Autodesk to flesh out the idea. I had several thoughts going in of what the lampshade and supports could look like, but I wasn’t sure what the best combinations would be. With Autodesk, I figured I would be able to more easily visualize different shade and support combinations than I would otherwise have been able to on paper. Though the final design ended up being very difficult to produce, Autodesk proved to be a useful design tool and I’ll definitely use it more in the future. Like I mentioned before, I got a little carried away with the design of the lamp and ended up creating a shade that involved way too many pieces. The slat-based design called for 34 walnut pieces to be glued together into nine frames that slotted into the two cherry supports. While I like the final result, the time required to assemble it makes it a bad candidate for production on a larger scale. Before I give up on the idea completely, however, I may play around with the shade design to see if I can simplify it for easier production. It often takes several iterations before a product is ready to go, so I’ll be sure to update the blog with any further versions of the design. Last summer I sat down with my sketchbook and listed out a bunch of ideas for possible products I could design. This was at a time before I had launched my website when I only had two existing products (a coffee table and lamp). I ended up focusing my efforts on designing the Suspension Shelf and the Signature and Peering Lamps, but partway down my sketchbook page, I left a note to myself that it could be fun to design a wine rack. I've never been much of a wine drinker, but the idea of making some sort of rack appealed to me because of the opportunity it would give me to introduce a new element - a wine bottle. The wine bottle, I figured, would be a new and interesting piece to play around with in a system of tensioned cables and carefully balanced parts. Ten months later, I've finally had the chance to realize the idea. Since the last several designs I worked on were larger, more expensive pieces, I figured this would be a good opportunity to create something simpler and more attainable for the average person. With that in mind, I decided to forgo designing a large rack that could hold a wine-enthusiasts entire collection and instead opt for a smaller tabletop design that would hold four bottles. Sometimes I'll get stuck drawing basically the same thing over and over. Here I was stuck on the idea of using multiple cables to balance the wine rack. An early concept with multiple cables. Perhaps my favorite aspect of this design is the way the cables run down the front side of the rack before bending away to connect to the front of the base. It reminds me of the neck of the guitar and gives the piece a bit of an instrumental quality. With the key elements of the design figured out, I realized I needed some sort of accent to make it a complete piece. Though I was aiming for a simple aesthetic, having just two rectangular boards seemed a little bland to me. As a solution, I decided to employ an idea I initially put to work in the design of the Suspension Shelf and "float" a thin piece of wood out in front of the main diagonal board just to give things a little more texture and variation. The initial plywood prototype had a wider base than the final version. 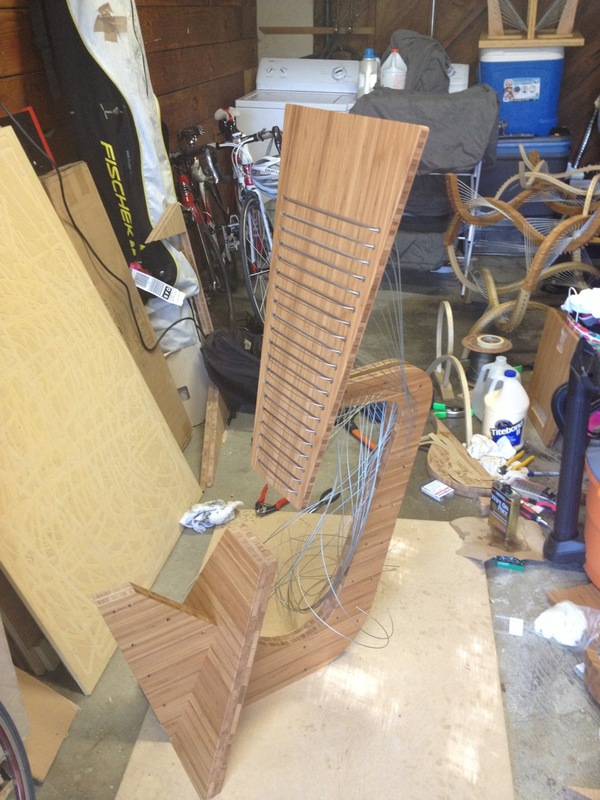 Once the design was finalized on paper, I moved to building a prototype in plywood. As usual, this process involved first recreating my design on the computer and then using a CNC machine to cut out the different parts that comprise the wine rack. The prototype worked pretty well, so after a couple quick tweaks I advanced to building the first polished version of the rack in my tried and true combination of mahogany and oak. The result was pretty good, I thought, but the colors of the mahogany and oak didn't quite sit right with me in combination with the typical colors of a wine bottle. Determined to find a better coloring scheme, I tried out two woods I had never worked with before: walnut and birch. Right away I knew I had found the right combination. The new colors looked great on their own, but, more importantly, they went very well with the wine bottles, too. I've probably written way too much at this point, so just enjoy some more pictures! If you want to check out the new product page for the wine rack, it's right here. 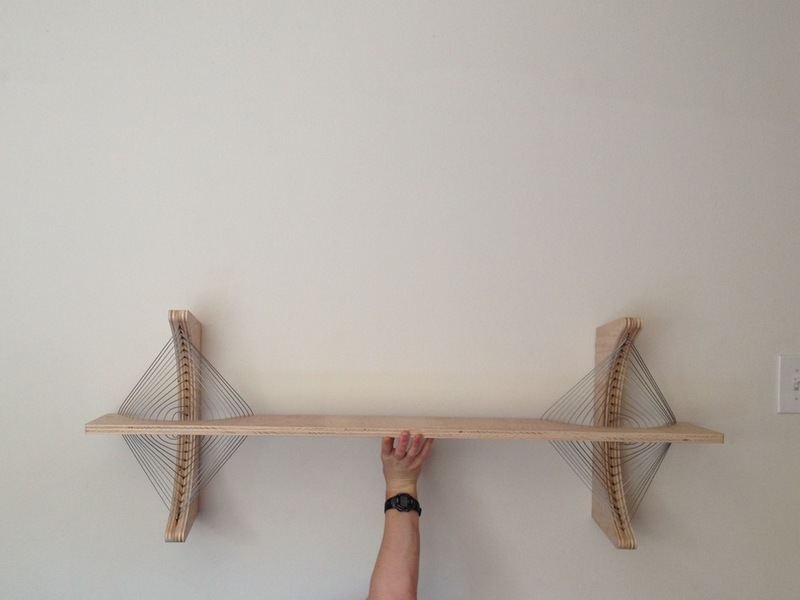 The mahogany and oak version of the rack. Just over one week ago I attended the Architectural Digest Home Design Show in New York. It was my first ever major show and it turned out to be a lot of fun. The most rewarding part of the whole experience was getting to see most of my designs together in one place – something that has never actually happened before. Along with showing my coffee table, shelf and lamps, I introduced two new designs at the show: the Arc Floor Lamp and the Balance End Table (I’ll post more about those later). Special thanks go out to Hannah Hausman and Nat Hewett, who helped man the booth on Saturday and Sunday. Also, a huge thank you to my dad, who drove across the country with me in four days in a van filled with everything for the show. From left to right: Suspension Shelf, Balance End Table, Contour Coffee Table, Signature Lamp, Peering Lamp and Arc Floor Lamp. I recently finished work on a set of two custom lamps for a client. The lamps are a modified version of the Contour Lamp, designed to sit on bedside tables rather than on a desk. The lamps’ curves are modified to continue around a little more so that the shades are positioned vertically rather than at an angle. In addition, the shades are more flared than they would be on a normal Contour Lamp, which allows them to fill the negative space created by the extended curve. One of the client’s requests for this project was that the wood used in the lamps complement that used in his bedside tables. 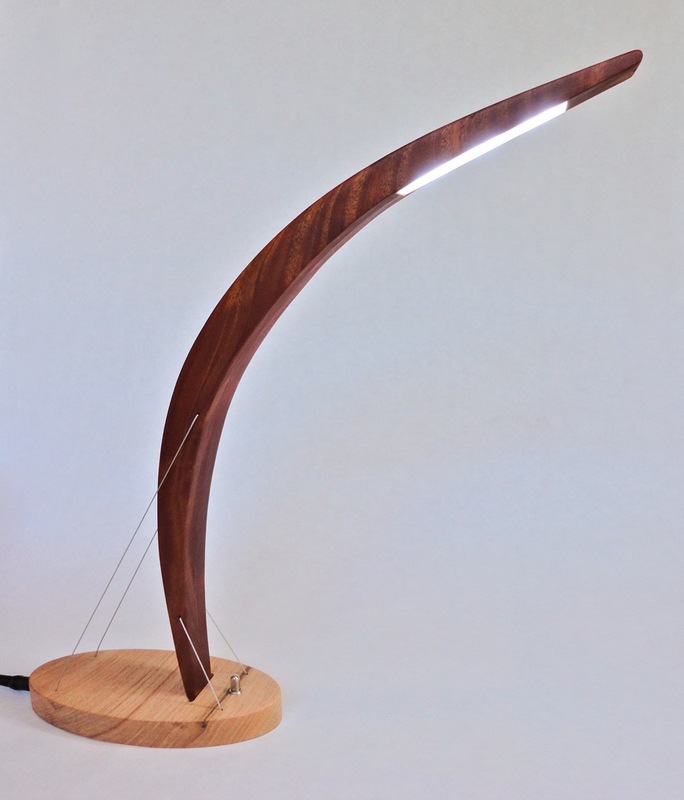 In this instance, the bamboo typically used in the Contour Lamp design did not seem appropriate, so I turned instead to Brazilian Cherry (a wood I had never used before). At first I was unsure whether this wood would mesh well with the CNC machining process I use to make many of my designs. Certain woods tend to chip easily or router bit breakage, so I was pleasantly surprised when nothing went wrong. The Brazilian Cherry turned out beautifully and I’m eager to find another use for it… Maybe in one of the new designs I’m working on now! Time to write about the last of my new products: Bamboo growth charts for kids. These are pretty different from my usual work – they lack the cables and sculptural elements I love so much - and were inspired by my niece’s first birthday last February. I designed the first growth chart as a gift and ended up really liking the idea and the way it turned out. My girlfriend and I had gone around to a bunch of baby stores looking for the perfect present, but nothing really jumped out at us. We started thinking about something we could make instead and eventually came up with the idea of a custom growth chart. My sister and I always liked getting our heights marked on the wall as we were growing, but when we moved we lost the markings forever. With that in mind, I decided to create a design that would be fun for kids to look at and which could also be easily removed from the wall, folded up, and transported if a family moved. I was so happy with the result after making the first chart for my niece that I decided to design a few more and offer them for sale. Each height chart is made of three bamboo panels with laser-etched designs that I originally created as pen drawings. Each chart also has a place where a child’s name can be laser-etched to customize the piece (either above the monkey, along the topmost tree branch or on the rocket). I’ll probably end up making more gifts for my niece and if they turn out well I’ll be sure to post about them here! I’m thinking something with wheels for her next birthday… An awesome mobile sculpture car maybe? Now for the third of my new products – the Peering Lamp! A close-up of the LED module without the light-transmitting acrylic cover. If you saw my post two days ago, you might notice that this design is very similar to that of the Signature Lamp. After finishing work on the signature lamp, I was so psyched about LEDs and the mahogany and oak design I had just come up with that I wanted to create more. I had figured out most of the annoying, time-consuming details (like what light switch to use and how to mount all the wiring inside the lamp base) with my first run-through, and I could now make another pass without having to deal with any or that. With this new lamp, I decided to go in a different direction in terms of cabling. In my other works I employ cables as structural elements, but I often use more than I have to in order to create interesting, intersecting contours. With this design, however, I wanted to experiment with a more minimal approach. It was my aim to use as few cables as possible to create a stable system without using any other fasteners or adhesives. As I soon discovered, I only needed two cables to achieve stability. The first cable passes through the lamp’s mahogany curve low down near the base and pulls it downward and forward. The second cable passes through the base higher up and pulls it downward and backward. As such, both cables pull the curve down and firmly into a small notch in the base, thus keeping it from sliding anywhere. At the same time, the cable cables provide forward and backward forces that cancel out and have the net result of holding the mahogany curve solidly in place. With seemingly so little needed to hold everything in place, I opted for an exaggerated, large curve that would suggest imminent movement as it leaned forward and away from the small base. From the back. With this design, my aim was to create a sense of impending motion. Brightness test... The lamp provides a lot of light! You can check out the product page for the Peering Lamp here. Time for another post about one of my new products! Today it’s the Suspension Shelf. The idea to make a wall-mounted “floating” style shelf came to me last summer during a brainstorming session (side note – brainstorming for me is basically doodling for hours and seeing what happens – see the picture to the right). I thought the idea had some promise and quickly got to work sketching out and building some prototypes. You can check out the results of those prototyping sessions here and here. I tried out five different designs without stopping and, when I finally took a break to consider the results, I realized none of them was actually very good. There was too much going on. The curved cutouts breaking into the shelves didn’t look right and the shapes of the fins that mounted to the wall were a bit awkward. The cabling pattern, which would have looked good by itself, just seemed excessive in the context of the shelves. In short, the designs weren’t elegant. It was back to the drawing board. As I considered alternatives to the design problem, I came to the conclusion that I had to, in a way, start from scratch. With the previous shelves I had tried to implement my go-to cabling pattern and, while it worked well for the Contour Coffee Table and many of my sculptures, it wasn’t right in this instance. As such, I tried to approach the problem with fresh eyes. 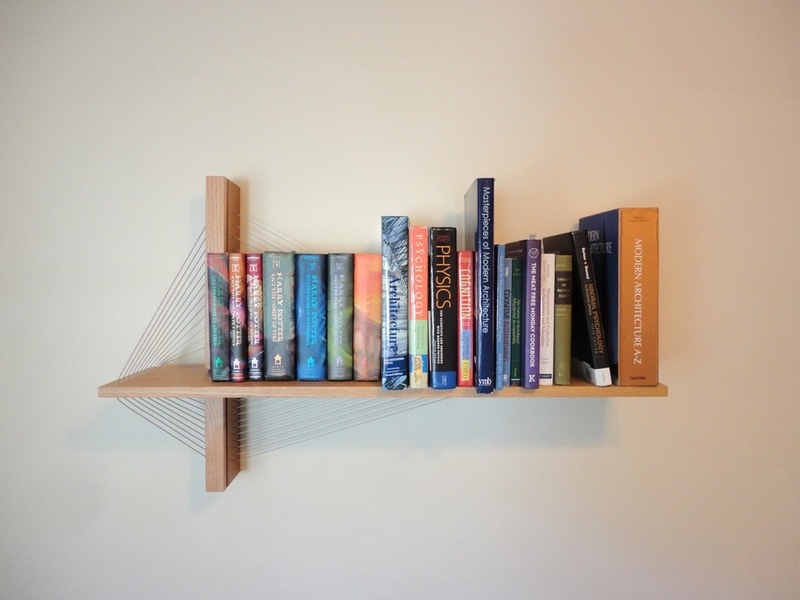 I knew I wanted the shelf to be comprised of wood and steel cable, but beyond that I tried to wipe the slate clean. How, I thought, would I have approached this problem three years ago if I were coming up with some method of cabling for the first time? Above all else, I thought, the solution had to be simple (the simplest things are often the most elegant) and once I got in this mindset, the answer came surprisingly quickly. Rather than trying to use curved pieces that just didn’t jive that well with the idea of a shelf, why not just use two simple rectangles? A vertical rectangle could be mounted to the wall and a horizontal one (the shelf) could be cantilevered out and supported by the cables just like a suspension bridge. I carefully sketched the concept out and then got to work. I had to determine how much weight the shelf could support, so what better way than to put all my heavy books on it? It's pictured here with 60 lbs. Didn't seem like weight should be a problem. You can check out the Suspension Shelf product page here. Welcome to the new site! I’ve been working on a bunch of new stuff for the past couple months and now it’s finally time to share what I’ve been up to! I have several new designs that I’m ready to release and I’ll be posting about them for the next few days. Today’s feature is the Signature Lamp! The Signature lamp is a compact LED lamp that, like many of my other works, makes use of steel cable under tension to create a carefully balanced system. The design for the Signature lamp was inspired by the logo that I developed for my new business. Creating the logo, I wanted a simple form that would capture the essence of my work and the design I eventually came up with was not based off of any particular piece, but I thought it worked well. I started thinking about how I could make something physical out of this abstract, 2D form and quickly settled on the idea of a lamp. I had wanted to experiment with LEDs for a while now and this seemed like the perfect opportunity. The logo design was, or course, not well suited to incorporate a traditional light bulb, but LEDs might just fit perfectly in the thin curve that was the central element of the logo design. The design process took some trial and error and, surprisingly, the most difficult part was finding the right LEDs and, even more so, a good light switch. I spent hours online looking at different switches (I don’t think anything else is more boring) and tried out a few lemons before I finally found one that fit the look of the lamp well. Developing the sculptural design of the lamp was a whole lot more fun. The logo provided me with a general idea of what I wanted things to look like and I took it from there. Unassembled parts for the Signature Lamp. You can see the CNC - cut channels for the LEDs and electric wiring. I used the exact shape of the curve from the logo as the central element of the lamp and used a CNC machine to cut all of the pieces and create all the channels necessary to hide the electric wiring. What I ended up with was a mahogany curve perched atop a red oak base and supported by cables under tension running between the two. I had never used either of these woods before, but I decided early on that I wanted two contrasting natural colors and these two fit the bill. I think they worked out great! I didn’t use any adhesive or fasteners to hold the curve in place; it just sits in a small groove cut into the base so that it doesn’t slide anywhere. The LEDs I chose are ultra bright, so the final step was to find a nice light transmitting acrylic to cover them. The end result is a functional, compact lamp that I’m really excited to share with everyone! The lamp in an otherwise pitch black room... It's pretty bright! The Signature Lamp in its natural habitat. Two days ago I wrote about my idea for floating shelves and shared the first prototype. Now I’ve had a chance to try out a few new designs and I figured it would be fun to share them! Like the first prototype, these designs are pretty unpolished and are more exploratory pieces than finished products. However, I definitely feel like I’ve taken some steps forward in moving towards a final product. The first of the new design is similar to the original prototype, but much more compact. The vertical spine on the original prototype was much too big, I thought, so I shrunk it down in this second version. I also changed the location of the crimps that secure the steel cables in place. In the original version they were located just behind a slot that ran down the middle of the spine and were completely visible if you looked at the shelf from the side. In the new version, the cables run though internal channels to the back of the spine where they are secured by crimps in a recessed area that’s totally hidden. As with the original prototype, this shelf was designed with the idea that it could be an easily stackable modular unit. The second design is similar to the previous one, but has a curved shelf. I’m not totally sure what I think about this one. It looks sort of cool, but at the same time is not that practical. The shelf would be good for holding small knick-knacks, but little else. The final design is my favorite. It is a longer bookshelf with supports at either end. I think this design has a nice balanced look and is the most practical of all the designs. I plan to continue playing around with this concept a little more before anything is finalized, so stay tuned! Last week I decided it was time to start working on some new designs. I thought for a while and wrote down about 30 different ideas, then decided to just jump right in and start tackling them one at a time. The first project I’m working on involves the idea of “floating” shelves. Most of my work centers on suspension designs that use wood and steel cable and I figured I might be able to make some sort of wall-mounted shelf using these principles. The initial idea was to create a wooden spine that would mount to a wall and then to suspend the shelf from it in such a way that the shelf never actually touches the wall or spine, but instead appears to float. I did a little sketching and then jumped right into making a prototype out of plywood just to see if making such a thing would be possible. The prototype is just a first pass and there is definitely a lot of room for improvement to the design, but with this initial go-around, I learned that the concept is definitely feasible. The prototype was plenty stable and would definitely be able to support books and other knick-knacks. Now I just need to work on aesthetics! The prototype’s spine is way too big and the shelf looks a little too bulky to me as well, so those are the first things I’ll try to tackle. The initial prototype. I will definitely be making plenty of changes to the design before it is finished. Here's the last of three little sculptures I recently made. This one's a little different from the other two, as it uses two poplar curves instead of just one. The cables that are strung between the two curves are oriented so that they create forces that act on the suspended "wing" curve in every direction. The result is that these forces cancel out and the wing curve is held solidly in place in relation to the looping curve. I made a sculpture similar to this one about a year ago, but wanted to tackle the design again with some slightly different and larger curves. Perhaps my favorite aspect of the design is the contours created by the cables, which constantly change as you move around the piece. Now if only I could figure out a way to apply this design to making something practical! In the same spirit of my post from several days ago, here's another little experimental sculpture. 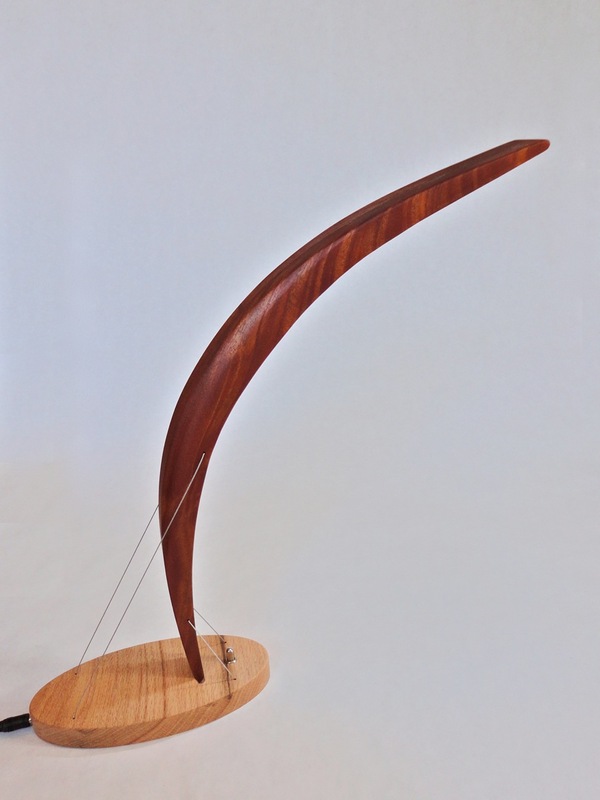 In this one, the laminated poplar curve is balanced atop a steel rod. Steel cables provide tension that keeps everything stable and in place while also creating interesting contours. Creating different contours is perhaps my favorite aspect of making these little sculptures. There seems to be almost endless variations depending on the shapes of the two pieces of wood you're joining together. I always sketch out my pieces beforehand, but not until they are fully completed do I totally understand how the contours will play out. 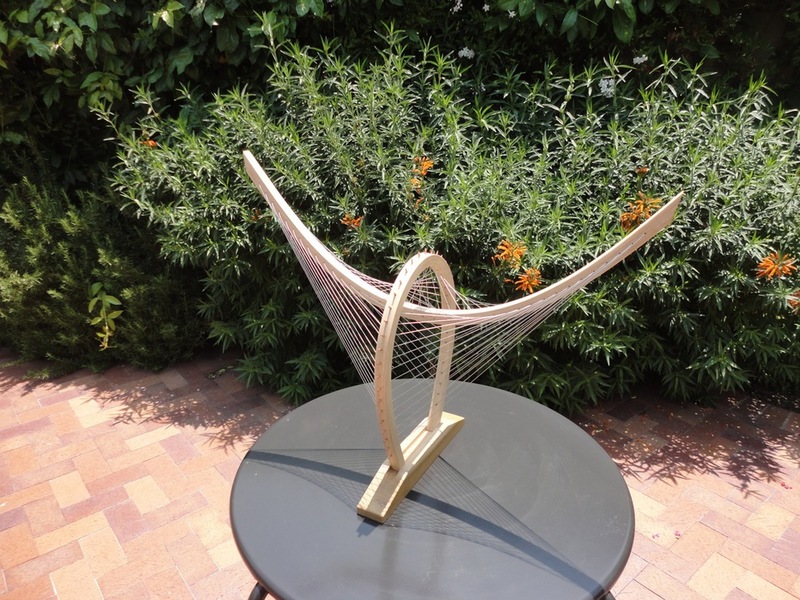 I'm not sure yet how this design could be applied in some practical way, but it seems promising... Maybe a hammock? While most of my time is spent designing and making sculptural furniture and other practical things, once in a while I'll just do a quick sketch and then make a sculpture of that sketch. It's a fun little break, but also serves the purpose of helping me get ideas for future projects. When I did this most recently, I was really happy with the result. 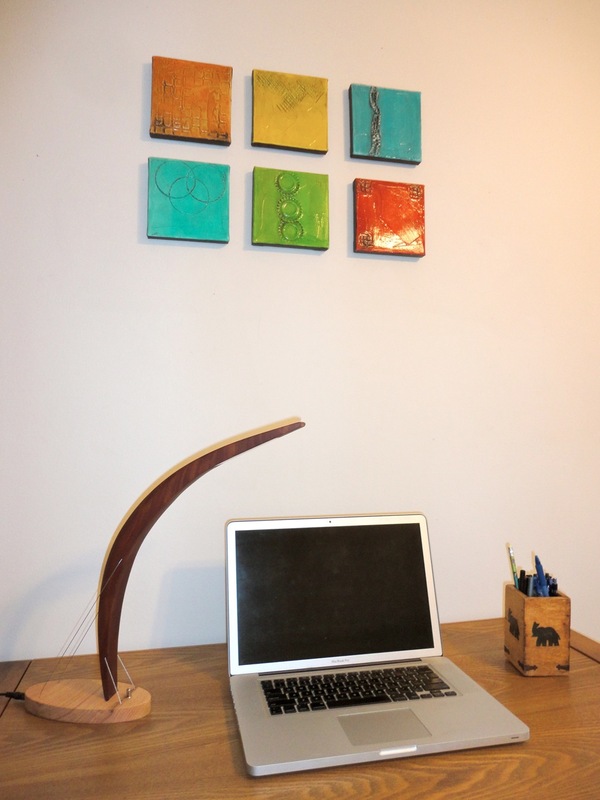 The sculpture consists of a laminated poplar arch balanced atop two prongs coming off of a plywood base. The arch is held in place only by the tension provided by the steel cables that run between it and the base. Admittedly, the plywood base isn't that attractive, but the contours created by the cables are, I think, incredible, and I'm looking for a way to implement some version of this design in the future. I'm not totally sure what I could use it for yet, the the image of a massive, awesome swing set keeps popping into my mind. 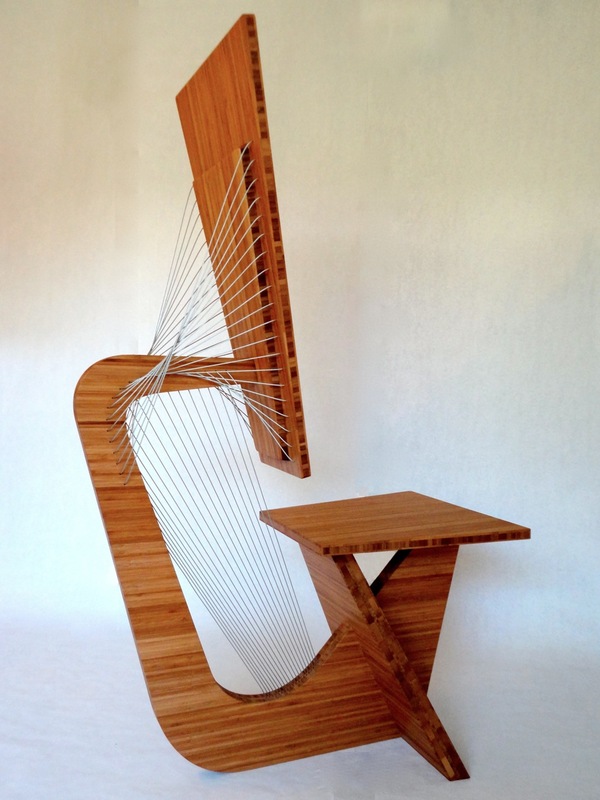 Last night I wrote about making the prototype for my sculptural desk chair design. Now it’s time to share the finished product! As I mentioned yesterday, I always knew I wanted the final version to be made of bamboo, so before starting work on it I had to make sure everything was perfect. I tweaked a few of my computer files, with the biggest change being a more angled backrest. Additionally, the man I was making the chair for had a fondness for high-backed chairs, so I stretched the backrest a bit to make it a little taller. As with the prototype, the first step was to cut out all of the parts with the Shopbot. This process was a little more complicated than a normal Shopbot session, as the complex design called for three different bits to complete each session (one to cut the channels, one to drill holes and one to cut the outline of each piece). The whole process went smoothly and I quickly moved on to sanding and staining. One half of the center spine after coming off the shopbot. Internal cable channels are visible. Once each piece was nicely finished, assembly began. I slotted the base together and then moved on to stringing the cables through their respective holes and lining them up with the proper channels. Of course, this part ended up being much more difficult than it was with the prototype. As I mentioned yesterday, the process of working the cables into their respective channels while gluing the two halves of the central spine together is a little tricky. The cables have a tendency to pop out of the channels and get in the way of the two halves coming together. My error in moving from prototype to final version of the chair was that I made the cable channels a little less deep in the latter version. The prototype channels had a little extra wiggle room and I thought things would look better if they were smaller. Mistake! While the cables still fit just fine, making the channels smaller ended up making it much more difficult keep the cables in place while gluing the two halves of the spine together. What had taken me 15 minutes to accomplish with the prototype ended up taking about three hours this time around. Just before gluing the two spine halves together. Cables have been threaded through their holes, but not placed into their channels. In the end I managed to get everything in its place and I moved on to the final step of tightening and locking the cables to secure the backrest in place. I’m really happy with how the final product turned out! Cables entering the bottom of the spine. A couple of months ago I was contacted by someone who was interested in having me design a desk chair for him. I was in the midst of my Kickstarter campaign at the time, so I only got around to the project this past month. I’ve been really into using bamboo recently and I decided pretty quickly that would be my main material for this project. Bamboo is expensive though, so before plowing ahead I decided I better make a prototype. I started out with the usual sketches, coming up with about five different designs that I liked. One design, though, stuck out above the rest. It would be the trickiest one to make, but it had an instrumental quality to it that I loved. I wasn’t sure if the design was feasible, so I moved on to some more precise drawings. 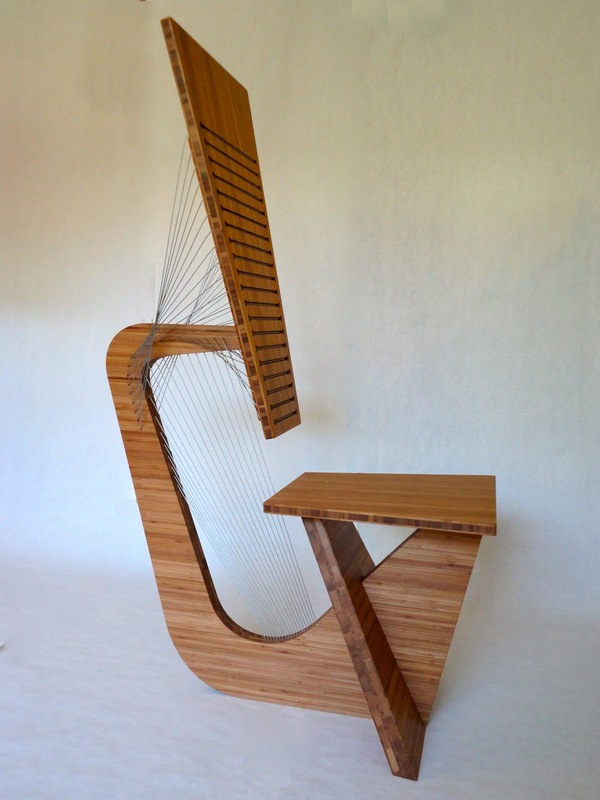 As with most of my work, the chair employed steel cables under tension as a key feature of the design. The cables, I decided, would hold the seatback in place by pulling it firmly against a single contact point. What made the design so tricky was that I wanted each of the cables to enter and exit the central spine several times and, at certain points, to run through internal channels. I knew that I could design my pieces on the computer and cut them to precision with the Shopbot, but I wasn’t sure if it there would be enough room in the central spine to cut the 20 channels I was hoping for. Additionally, there would be the problem of threading the cables through the channels once the time for assembly came. I knew I would have two use two halves to make up the central spine and, because of the crazy angles involved, I would have to get all the cables in place before gluing the two halves together. I wasn’t sure if it would work, but I decided to give it a go. Before making the chair out or bamboo, I decided to create a prototype with cheaper regular plywood. To my surprise, everything went pretty smoothly. I designed the different parts on the computer and cut them out with the Shopbot with no problem. The most difficult part, as expected, was the assembly. I had to thread all the cables through their holes and then carefully align each one with the proper channel before gluing the two halves of the central spine together. Gluing the spine was a little difficult since the cables had a tendency to pop out of their channels and block the two halves from coming together, but things went about as smoothly as I could have hoped. After letting the glue set overnight I pulled each cable tight and secured it in a recessed area in the base of the chair. With this process, tension was added to the seatback, thereby locking it in place. 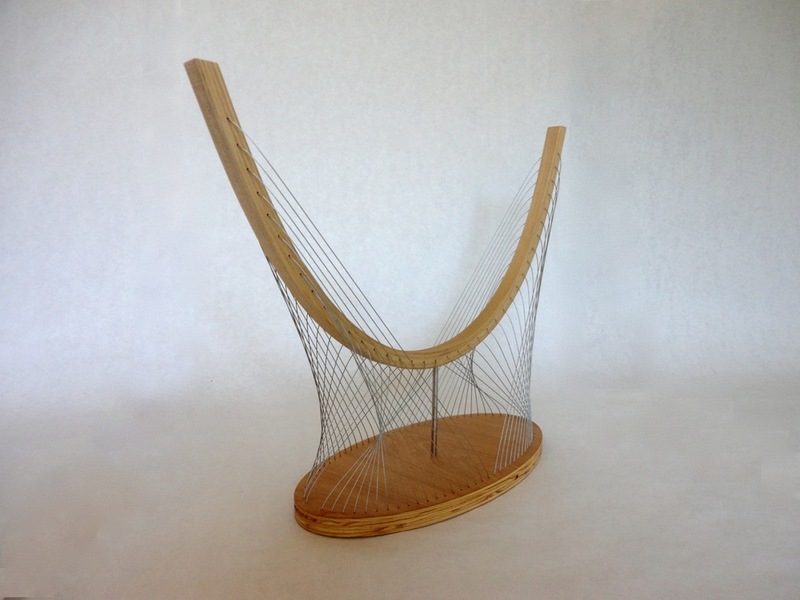 That’s it for now, but check back in a day or two for a post on the finalized bamboo chair. The past four months have been crazy. The last time I posted to my blog it was late December and I was in the middle of running a Kickstarter campaign to launch my most recent table design. In early January I reached my fundraising goal and watched happily as pledges continued to roll in. The final days of the campaign brought with them an upswing in interest and even more pledges and, by the time the clock had run out, my excitement was mixed with a heavy dose of trepidation. I realized, basically the second the clock ran out on my campaign, that things look a whole lot different once the reality of having to go into production sets in. From my point of view, the whole Kickstarter experience has two distinct parts to it and it’s hard to imagine the second while you’re still dwelling on the first. The campaign phase is so intense itself, with the project page building and planning and subsequent outreach and publicity that it’s hard to actually put yourself in a post-campaign mindset. Furthermore, there’s the fact that you don’t actually move on to fulfilling orders unless you reach your campaign goal. That means that, no matter how much you plan for it, the production phase is still somewhat of a fantasy until you know you’re going to get the money. So there I was in mid January with the suddenly very real task of producing and shipping 22 tables, 11 lamps, 8 sculptures and a handful of prints. There were plenty or roadblocks and hurdles along the way, but I was eventually able to complete all orders and get everything sent out by the end of March. Rather than recount the whole production process, I figure it's be best to just show it with a bunch of pictures taken over the course of the project. Enjoy! The first batch of cables and crimps I ordered as production got underway. A batch of curves after getting a coat of polyurethane. At this point I said goodbye to any free space in my garage for the next few months. Stacked curves waiting to be assembled into tables. After delivering tables to my local backers with my car, it was time to start packing and shipping. I originally planned on making the boxes myself, but when confronted with the actual task I quickly realized it was way worth it to just buy some boxes. The garage just before packing commenced. Figuring out how to package everything so it wouldn't explode in transit took a while. I ended up getting a bunch of insulation foam and using it to hold everything in place. Packaged table. I sent them out all over the country. One even went to Abu Dhabi! The first batch of boxes I took to FedEx. Seven more trips followed. All things considered, the whole Kickstarter experience was incredibly exciting and rewarding, though there were plenty of moments of anxiety and frustration. It was a big relief to finally get everything sent out and I'm enjoying having a little less on my plate. Since early April I've started work on a few new projects and will be writing about them soon. Stay tuned! Time for another Kickstarter update! It has now been two weeks since the launch of my Kickstarter campaign, meaning that it is just about halfway over. At this time the project is 70% funded, so the end is in sight! As I mentioned before, Kickstarter projects tend to lose momentum in the middle of the campaign, so the goal right now is to get more people visiting the page. If you haven't seen the project yet, take a look at my Kickstarter page to see all the rewards I'm offering. And, as always, please spread the word to anyone who might be interested! Now, for anyone who's interested, here are a few pictures of different stages of the table's production. 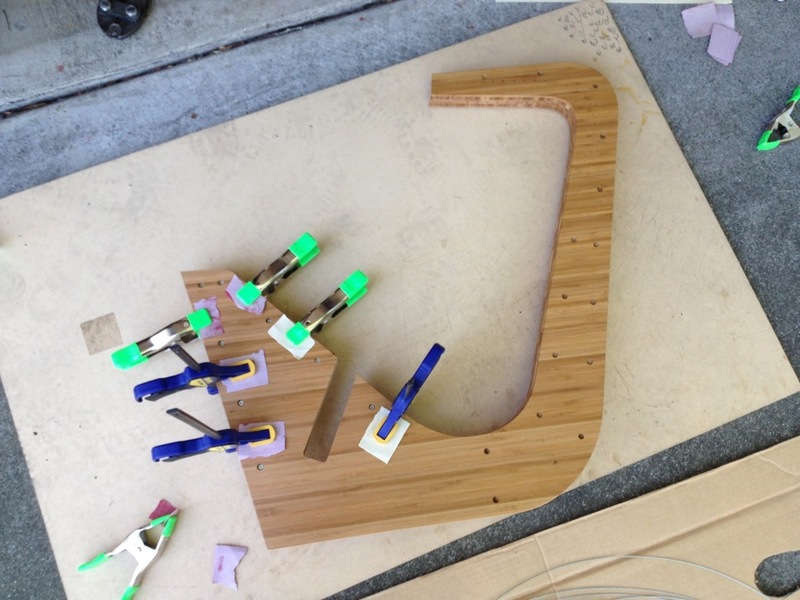 After receiving a thin layer of polyurethane, the curves are placed in a jig and wiring commences. When everything is wired up and excess cable is snipped, the completed base can be removed from the jig. Time for a quick Kickstarter update! I launched my Contour Coffee Table project last Thursday and, since then, things have gone much better than I anticipated. It has been just five days and I have already reached 50% of the fundraising goal. So, a "thank you" is in order to any of you who may have pledged to the project or helped get the word out. Kickstarter projects always do the best at the very beginning and very end of the campaign so now, almost a week in, the goal is to keep momentum up. If you haven't seen the project yet, check out the video above or visit my actual Kickstarter page to see all the rewards I'm offering. And please, spread the word to anyone who might be interested! After lots of preparation and fine-tuning, my Kickstarter Campaign is finally up and running! I wrote several posts a few weeks ago to talk about Kickstarter and the different products I created for the campaign like the lamp and table. The only things that have changed since then are the product names. "Tense Coffee Table" and "S-Curve Lamp" were more working titles and, I must admit, not the best. I have now settled on the names "Contour Coffee Table" and "Contour Lamp" as a way of tying the two designs together. So check out the Kickstarter page to learn more about the designs and other rewards and please share it with anyone you think might be interested! As I mentioned in my past two posts, I’m going to be launching a Kickstarter campaign soon (hopefully within the next week) in an effort to get my work out into the world. I’ve already written about the S-curve Sculpture and the lamp that will be two of the lower-tier rewards for my campaign, so today I’m going to share my main product: The Tense Coffee Table. Last month I finished work on the first version of the Tense Coffee Table, a modern design with a hand-made base, steel cable and glass top. I received a bunch of really positive feedback on it. Due to the interest in this particular design, I decided that if I was ever going to try my hand at producing a product on a larger scale, this was the one to do it with. The main allure of producing on a larger scale for me was the idea that I would have a streamlined process that would help me create my tables more quickly, therefore allowing me to sell them for less and get them into more hands. As it stood at the end of October, however, the design of the Tense Coffee Table was not streamlined in any way for production. The main hindrance was the fact that each of the four S-curves that made up the table was hand laminated in a process that involved gluing twelve pieces of thin wood together and then clamping them into a mold to dry. The time spent first cutting the wood into thin strips and then gluing the strips and allowing them to dry just didn’t mesh with the idea of a streamlined production process. The laminated look was one of my favorite things about the original Tense Coffee Table and I didn’t want to lose that beauty. I had to think for a little while. I had recently been introduced to bamboo plywood and I realized that, unlike most normal plywood, bamboo ply actually looks good when you cut into it. Though you don’t get the same laminated look of the original table, cutting through the plywood reveals cross sections of bamboo that give a similar sense of multiple pieces of wood all joined together to make up one solid piece. Thinking about this, I finally came up with a solution. I would design the table’s S-curves on a computer and then use a CNC machine to cut them out of bamboo plywood. The result was pretty incredible! Although the process of making the new curves takes about one tenth as long as before, I think the final table looks just as good, if not better! Hopefully I'll be launching the Kickstarter by early next week... Stay tuned! Click here to go to my Coffee Table page and pass it along to anyone who my like this design. I am offering them at a discount on this site. If you're looking to learn what's in the pipeline, you've come to the right place! Here's where I post my crazy ideas and current projects. COPYRIGHT © ROBBY CUTHBERT DESIGN, LLC 2015. ALL RIGHTS RESERVED.